Hungary's rstrengthened razor wire border fence along an old railway line - blocking the route to refugees. 14 September 2015. New laws in Hungary, and Government attacks on civil society in the country, fuel “hostility, xenophobia, and discrimination against migrants, asylum seekers, refugees and all those trying to provide them support”, say a team of independent human rights experts mandated by the UN Human Rights Council. Hungarian legislation that criminalizes anyone who supports asylum seekers and other vulnerable individuals is “blatantly xenophobic”, “shameful” and “disgraceful”, the UN human rights chief said on Thursday. 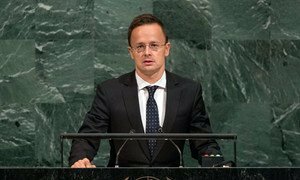 The migration crisis and associated threat of terrorism are the greatest threats ever faced by the European Union, Péter Szijjártó, Minister for Foreign Affairs and Foreign Trade of Hungary, told the United Nations today, denouncing those that encourage ‘waves’ of migrants, which were only putting thousands of people in danger.